Clan Stewart - les-renard-rouxs Webseite! The Stewart family records its traditional descent from Banquo, Thane of Lochaber, who makes an appearance as a character in William Shakespeare's MacBeth. Historically, however, the family appears to be descended from an ancient family who were senechals of Dol in Brittany. 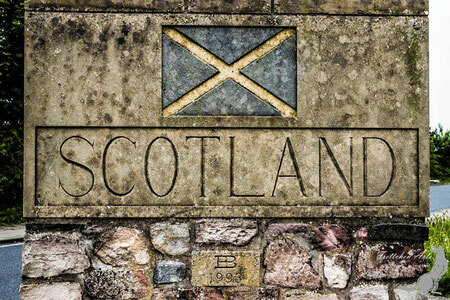 They acquired lands in England after the Norman conquest and moved to Scotland when David I ascended to the throne of Scotland. The family were granted extensive estates in Renfrewshire and East Lothian and the office of High Steward was made hereditary in the family. It is through marriage with the daughter of Robert the Bruce that we can begin to trace the descent of the Royal House of Stewart. The royal line of male Stewarts continued uninterrupted until the reign of Mary, Queen of Scots. As a family, the Royal Stewarts held the throne of Scotland, and later that of England, in the direct line until the death of Queen Anne in 1714. In fact, the present Royal family still has Stewart blood links. The Stewart tartan is worn by the regimental pipers of the Scots Guards and was referred to by King George V as "my personal tartan". 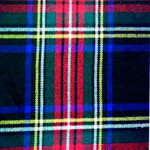 Known as the "Royal Tartan", it is still traditionally the official tartan of the Royal House of Scotland. The Stewarts of Appin form the West Highland branch of the great Royal family of Stewart, and have come to form a branch clan of considerable importance. Through marriage with the family of Lorne they became firstly Lords of Lorne and subsequently received a grant of lands at Appin. It was at Appin that was built the family seat of the Stewarts of Appin Castle Stalker, on the Cormorant's Rock at Loch Linnhe. It is from this location that was derived the rallying cry of the clan 'Creag an Sgairbh', or in English 'Cormorant's Rock'. Castle Stalker was built as a seat for royal hunting and fowling expeditions and is still one of Scotland's finest sights. The Stewarts of Appin were staunchly Jacobite and in the aftermath of the 1745 rising, the famous Appin murder took place. This incident is immortalised by Robert Louis Stevenson in his novel 'Kidnapped'. The chief of clan Appin, Allan Breck Stewart was the main suspect for the killing of Colin Campbell. He escaped justice however, and his half brother was arrested and tried by jury composed entirely of Campbell men. Not surprisingly, he was convicted and was later hanged. Today a cairn marks the place of his execution. Another famous branch are the Stewarts of Atholl are directly descended from one of the most notorious Stewarts of the fourteenth century Alexander Stewart, Earl of Buchan, more commonly known as 'The Wolf of Badenoch'. Alexander is most widely known for leading the raid which led to the burning of Elgin Cathedral in 1391. Later he built his stronghold the Castle of Garth and settled there. The descendants of Alexander Stewart became known as Athollmen and gave their allegiance to the new Murray Earls of Atholl. In 1822 an estimate was recorded that there were upwards of 4,000 Stewarts living in the province of Atholl, all descended from this one individual. The Atholl Stewarts were renowned for their fighting strength, and were able to raise a fighting force of 1,500 men during the reign of William of Orange.